I’d gone to bed at 10pm the night before. Not that I particularly wanted to, but, like everyone else, I’d been driven out of the hostel common room by a large, loud, noisy group who seemed to shriek with laughter at every available opportunity. Not that the bedroom was much comfort, being as it was, right next to the common room. The early night meant I was awake suitably early – this time at 5am in time to hear the rain come down outside. Then stop. Then start again. Sighing I resolved to check the map over breakfast to see what escape points there were on the route ahead. As it happened the sun was out when I headed to the bus stop in plenty of time to board the 0917 bus back to Dungeon Ghyll. Given the bus was late, my wait was especially long! 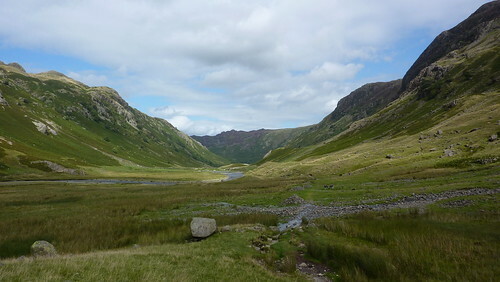 Given I had 15½ miles to walk, I was keen to get a move on, and the gentle stroll through Mickleden made that easy before I had to climb up the Stake Pass. Whilst not the most arduous of climbs, it still took about two hours just to cover the first 2½ miles. Still the views down Great Langdale were well worth it, and it was with a sorry heart that I bade farewell to them as I reached the summit of the pass and entered a plateau of hummocks – small “bobbles” on the landscape, looking almost like ancient burial grounds. The landscape ahead was hidden for some time, before the mighty valley of Langstrath was finally revealed, followed by a case of “What comes up, must come down” as I followed the delightful Stake Beck to the valley floor. 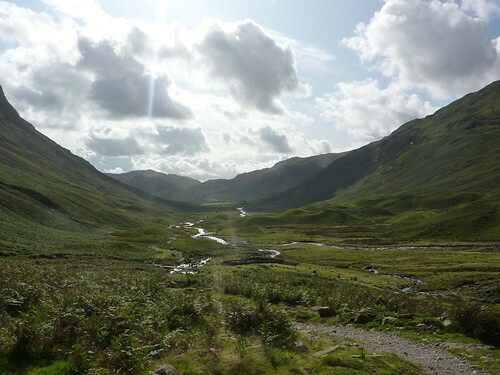 Like Great Langdale, Langstrath is a mighty, beautiful valley and getting to the end of it would take some time, and one that seemed deserted. I’d seen few people all morning, so to finally arrive at the valley end at Smithymire Island, and to find it on the busy side, was a bit of a surprise. This attractive area was full of people walking from nearby tourist spots, and the paths became a suitably gentle stroll as I wandered on, overtaking grannys with walking frames, and other admirers of the local waterfalls. After four, and still four miles to go, there was more twisting and turning alongside some lovely lake views. Aware I was perhaps pushing myself a little too hard, I decided to pause at the next sensible spot, before finally finding one at the beautiful Brandelhow Bay. It was yet another enchanting spot and one, if I’d had the time, I could have lingered at for far longer than I did. 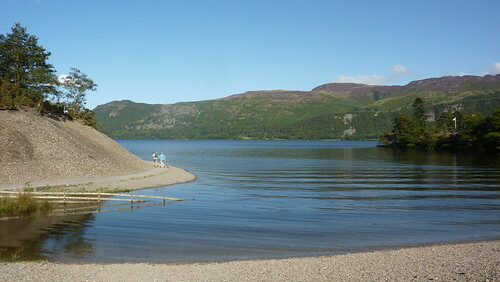 A little beyond it I passed a possible escape route – the busy pier for the Derwent Water ferry. 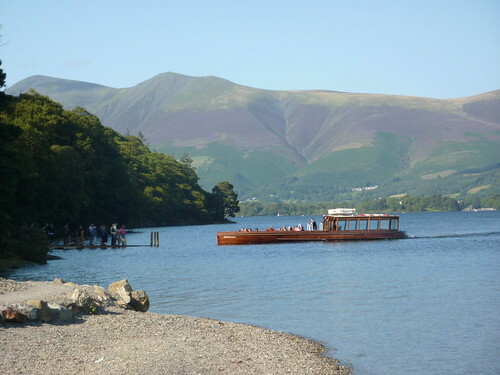 Loaded with people, it was sinking into the lake so much that it looked like people would soon be getting their trainers wet as the waited to be whisked back to Keswick. The Cumbria Way then took me through woodland and local park land. The going was rarely tough but it was a huge contrast to what I’d had for most of the day, and not quite as rewarding. Certainly no peace either as I passed by large families or groups of 20 somethings enjoying the sunshine. 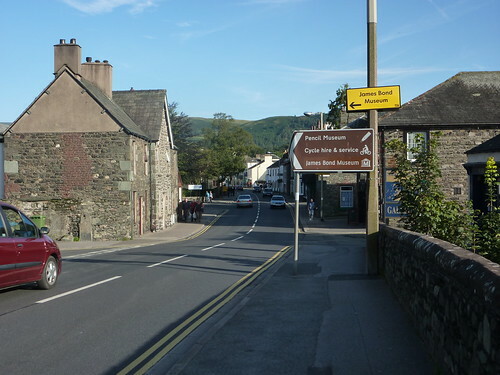 Keswick itself was even more busy – people bustling around everywhere, and roads with near constant traffic as tourists moved between the pencil museum and the scores of outdoor clothing retailers. My mind was more on a good shower and a change of clothes rather than buying a new pair of gaiters, however my comparatively late arrival meant disaster at the youth hostel. In my three man room, there was just one bed left. The dreaded top bunk. If you’ve every tried putting on a fitted sheet on a top bunk, then you’ll know why I dreaded it. Worst still, YHA Keswick seemed to have equipped the room with bunk beds more suitable for children than a 90kg, 31 year old bloke. Getting in and out in the low ceilinged room was a constant challenge and not one I particularly relished. One of my room mates had also been at Coniston. A cyclist living in the West Midlands, we exchanged dutiful pleasantries and conversation on various tourist related matters before I decided I really should go in search for good. 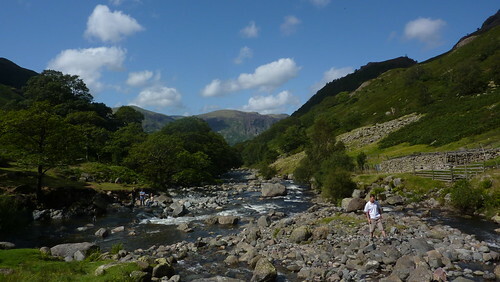 Having got over a strong desire for a curry, I dined in the hostel’s riverside cafe, scoffing garlic bread, Cumberland sausage and chips and washing it down with yet more High Pike and Catbells beer. And it was buying that second bottle that I can exclusively reveal the recipe for YHA Keswick’s Lemon Meringue Parfait. Take one meringue nest. Crumble into smallish chunks and place in a wine glass. Drizzle over lemon curd and small chunks of vanilla ice cream and mix slightly. Add double cream and put a cherry on top. First Published: 16 September 2009. Last Updated: 27 August 2015.